BRC Global Standard-Food is aimed at food manufacturers, especially manufacturers of private label products. It covers key areas of business activity in terms of quality and safety of manufactured products. A BRC Audit presents a complete picture of the plant, its production capacity and shows the potential safety hazards of the product. The customer can be sure that production is carried out in accordance with all the requirements, and that it is possible to trace the entire path of the product and the information of its origin. The standard was developed in Great Britain in 1998 by the British Retail Consortium. The standard is very popular around the world. IFS (International Food Standard) was developed by the Federation of German Retailers (HDE) and the French Federation of Trade and Distribution (FCD) for the auditing of suppliers to commercial chains, i.e. the private label manufacturers. this is a requirement imposed by the IFS . With the ifs certification, manufacturers can count on strengthening consumer confidence, where safety and quality of the product are most important. The certified system, through systematic analysis and process supervision, gives a higher product safety and lower risk of product liability. 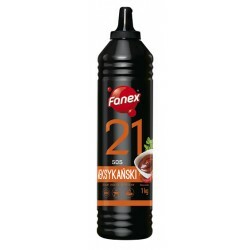 In 2012 four of Fanex's key products were awarded the „Discover Good Food” quality mark (Poznaj Dobra Zywnosc) by the Ministry of Agriculture and Rural Development. This helps customers choose food products with specific parameters and it confirms the company's involvement in the implementation of EU policies for widening the provision of high quality and variety of food products in domestic markets. Our flagship products – Ketchup No. 7 and „Wyborowy” Mayonnaise - have been awarded the „Q” quality mark for the last 20 years. The award comes from the prestigious Polish Centre for Testing and Certification. The mark is awarded to products for their above-standard quality, functional and health properties and also for satisfying safety and environmental protection requirements. . This prestigious award is given to economic leaders - entrepreneurs and managers, and to policy makers who create the conditions for improving the Polish economy. The "Lever" award can also be made to small and medium-sized enterprises, whose restructuring leads to production based on modern technical solutions and creates new jobs. Candidates for the award are put forward by the regional offices of FSNT-NOT (Polish Federation of Engineering), the editorial Board of "Technical Review" (Przegląd Techniczny), the National Chamber of Commerce and regional Chambers of Commerce. The awarding committee consists of representatives of NOT (Polish Federation of Engineering), the editiorial board of "Technical Review", the National Chamber of Commerce and the winner of the first "Lever" award. "Lever 2013" finals took place on the first day of the International Poznan Fair - "Innovations - Technologies – Machines".